Hope you had a great Fourth of July weekend! Mango Salsa – A simple, classic mango salsa recipe from the Houston Chronicle that I can’t find online. If I can get my hands on some more mangos, I’ll share the recipe! Banana Crumble Cake – I always seem to have one or two bananas on my counter that are waiting to be turned into something delicious (others would argue that they are ready for the trash bin, but they would be WRONG). I didn’t feel like banana bread, so made this little coffee cake-like treat. 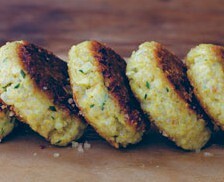 Super easy to make and the Misses liked it because they thought they could eat cake for breakfast! Mama’s Best Broiled Tomato Sandwiches – Get some really delicious tomatoes and make these easy sandwiches for a quick dinner. Watch them in the broiler though, my corners got a little too toasted and I had to cut them off! Shrimp and Spinach Pasta – Another simple weeknight dinner that relies on freezer and pantry staples for the most part, with some feta cheese and Greek seasoning. Whole thing takes under 20 minutes and is really good! 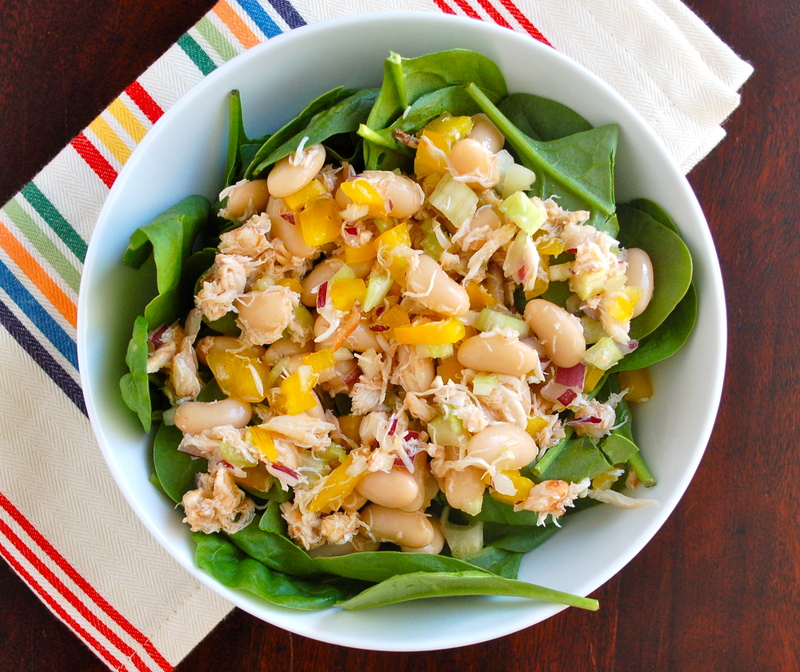 Crab Salad with White Beans and Gourmet Greens – Really delicious, fresh salad from a really old (1999) issue of Cooking Light! 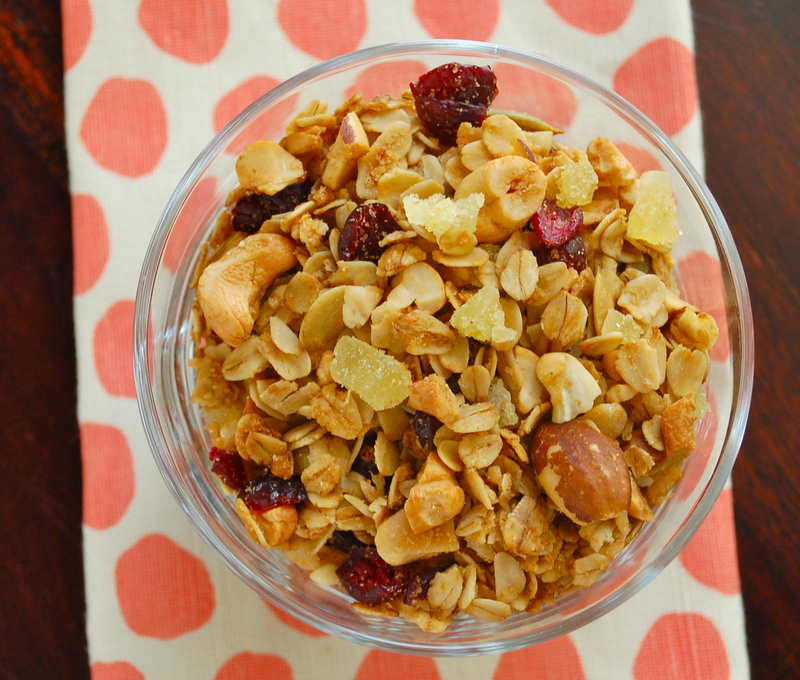 Cranberry Ginger Granola – Delicious with vanilla Greek Yogurt! 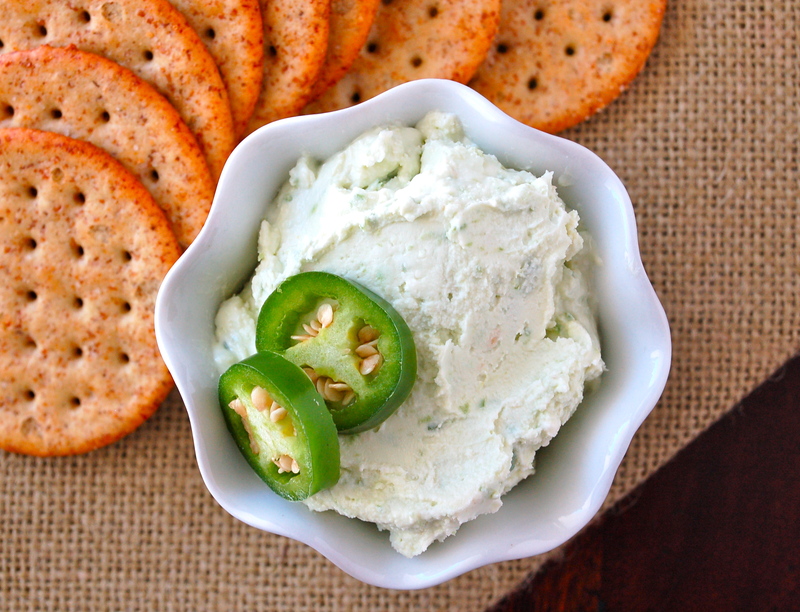 Jalapeño Goat Cheese – Two of my favorite things in one spread! Carrot Cake with Ginger Mascarpone Frosting – DIVINE cake from the Barefoot Contessa!!! Made for Father’s Day and it is one of the best carrot cakes I’ve ever had! 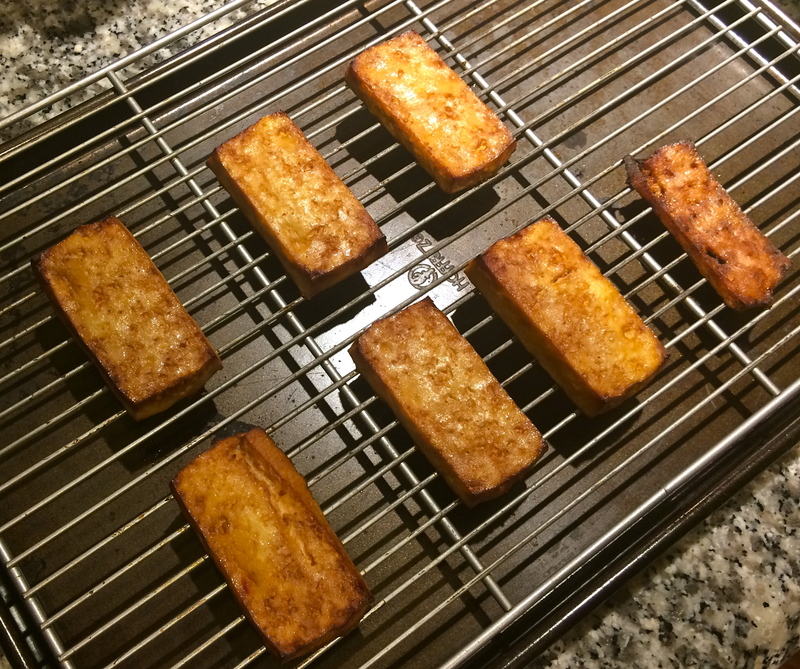 Marinated Roasted Tofu – Totally easy prep and the tofu turned out great. I used it on salads for lunch during the week for some added protein. Will definitely be making this again! Dry-Rubbed Salmon Tacos with Tomatillo-Avocado Slaw – I was worried about this one because the rub calls for coffee and quite a bit of assertive spice, but the salmon was so flavorful. The slaw was really great too. I made the full recipe of salmon (to ensure leftovers) and halved the slaw because I didn’t want the avocado to turn gross brown before we could eat the leftovers. I also used flour tortillas because I like them better. Oatmeal Chew Bars – A cheaty (uses cake mix) cookie bar that is really easy, gooey, and sticky sweet. Miss E loved. One-Pan Orecchiette with Chickpeas and Olives – If Erin likes it, I had to try it. Odd method in that everything goes in one pot to cook the pasta. Was really worried about it, but turned out fine. We both liked this pasta, but D liked it more than I did. The raw arugula is a nice addition. So, that’s it for June! 16 more cards to be filed away for a grand total of 88. Not quite to 100 yet, but still pretty happy with the progress so far. Hope you are a little inspired by some of my makings this month! Happy July!